Historical Organization of the Week: Salem County Historical Society ~ The History Girl! 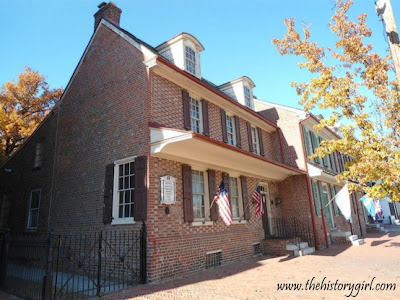 This week, I am featuring the Salem County Historical Society. The mission of the Society is to seek, document, preserve, interpret, and perpetuate Salem County's heritage, and to enhance the awareness and appreciation of that heritage, through its research, collections, functions, exhibits, educational programs, and publications, for the benefit of future generations and for the betterment of the community. The Society is housed in three interconnected historic homes, the centerpiece of which is the Alexander Grant Mansion House, built circa 1721. The Society also maintains a stone barn built in 1950, the John Jones Law Office dating to 1735, and the Log Cabin Educational Center, circa 1850. These buildings all house engaging exhibits related to Salem County. The Society's library offers researchers family records, manuscripts, deeds, newspapers, maps, rare books, diaries and journals, church records, and many other historical publications. The Society relies on memberships, fundraising, and countless volunteers to continue its mission. For more information on programs, special events, and exhibits hosted by the Salem County Historical Society or to become a member or volunteer, please visit www.salemcountyhistoricalsociety.com or call 856-935-5004.